Wedding Planning - What Should Your Priority Be? The first thing you need to do is set a date, right? And to do that you need to secure your venue so that’s priority number one on your todo list. What’s next? There’s so many things, right? But let’s shift our attention to what’s most important. I understand I have a bias here, but stay with me. I’m going to borrow some thoughts from Maurissa Jean McNellis, a wedding photographer from Minnesota, who made these comments on Facebook. “Photos are the one memory you can pull out every day to see. Can you pull out the cake every day to retaste it? Can you smell the bouquet every day? When you are 80 years old are you going to pull out the wedding dress and put it on to remember the day? She went on to talk about how she was where you are right now and she chose the less expensive photographer. She did get sharp images but not nearly what she had hoped for. So now she pays the price for trying to save money on photography, for many years to come. For a wedding, a lot of things are essential. For the rest of your life, good photography at that wedding is a top priority. Will you remember how the cake tastes or how the photos look? Sometimes we seem to be as changeable as the weather. Clouds makes up gloomy. Sunshine makes us happy. So for our wedding, we want bright sunshine without a cloud in the sky, right? Wrong! 1) Partly cloudy with blue sky and maybe the sun peaking through. 2) Partly sunny with clouds floating in the sky. Essentially any kind of broken sky is the best. 3) Rain, snow, ice - there’s interesting things going on here! Yes, it’s challenging but oh the possible photos! 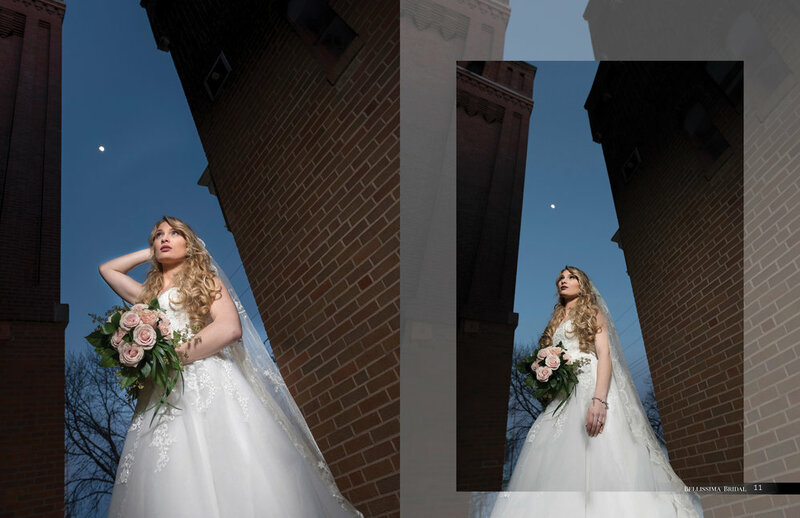 4) Full overcast - it may be gloomy but the light from a cloudy sky is absolutely the most flattering for a bride. 5) Full sunshine - Yes, I can make art in full sunshine but it is by far the most challenging. We want to keep the bride out of the sun. We aren’t vampires but we’d rather have any of the above skies than this one. Getting down and doing what it takes to get that shot! As wedding photographers we have numerous goals on your day. It starts with documenting the extraordinary story of your day with every bit of technical and artistic skill we posses. The title of this blog, “Obersvations of a Flying Wedding Photographer” comes from the experience of rushing all over the place to get those photos. It makes me feel like I am flying. To get those photos for you that you will cherish forever, we prepare our equipment starting the day before. We arrive before the time you have contracted us for so that we are ready no later than the time we have set to start shooting. And we do whatever it takes to get those photos for you. Please try not to laugh at me laying on the ground. But those kids are really cute! And getting down to their level gave me a chance to get you a photo you will remember always and they will have the chance to cherish too when they are older. Good wedding photographers employ a combination of artistry, technical skill, experience, athleticism, endurance, joy, exuberance, knowledge and fun in every wedding. One of the many reasons I love shooting weddings is that there are three people, the bride, the groom and me, that are excited to make art. Put that together with the beauty of a bride on their day and a great setting, and magic can happen! As a team, the couple and I, and my assistants, create stunning art. Our purpose is to create family heirlooms. Thinking of these couples’ grandchildren looking at these images on their grandparents wall or in a wedding album decades from now gives me chills. If it excites you, then let’s do it together! We'll be adding some of these to our permanent portfolio. This was a fun wedding to shoot. The landmark church, Holy Family Parish in Fort Madison, Iowa was really an honor and a thrill to photograph in. The families and the bride and groom were all a delight. This is not our first Ft Madison wedding and it won't be our last. Today in Fort Madison at the spectacular Holy Family Church I get to photograph the wedding of Natalie Cole and Josh Diton. This is like a fairy tale come true. Or it's a 21st Century love story but whatever it is, it's very romantic. Natalie is from Alberta, Canada. Josh is from Ft. Madison Iowa. They are video gamers who met online. I don't need anything more to this story for it to be romantic, but today we will write, and photograph more romance - the next step in their love story - the marriage of Natalie and Josh. Congratulations you two! Take a look at this fantastic aluminum print that Erica's parents had made for their home. You'll have to take my word for it but what you see on your screen doesn't come close to what it looks like in person. If you have not seen one of our aluminum prints you owe it to yourself to make arrangements with me to see one. I love these things. The ink is lab tested to last at least 60 years before fading. They are printed like a car is painted, in layers. First the aluminum surface is painted with a white primer. Then the print is heat transferred on top of that and finally a clear protective coat is applied to the top. I suppose you can scratch one, but you'll have to work at it! When their baby is off to college, her parents will have her high school senior photos on their wall to look at everyday. If you're looking for dramatic and different high school senior photos, we at Hal Masover Photography work at making every client's photos uniquely theirs. We shoot seniors in Fairfield, Iowa, Ottumwa, Mt. Pleasant and Burlington, Iowa. Easy! Just make a Facebook post like this one made by Kim Minh Ly. During that time, we have had the opportunity to meet and work with several fantastic photographers on different projects. Hal Masover has taken us on a photographic journey to the most fascinating locations, environments, and even costumes in the form of a one-of-a-kind silk 1940's parachute dress (yes, made from an actual military parachute custom-dyed and fashioned into a massive skirt and halter top). He entertains with great stories, coaches with authority and respect, architects the perfect background and lighting, and makes you as the model absolutely amazing in the finished results. If you are looking for the most breathtaking photos of someone special in your life (or of yourself for that matter), talk to Hal. I have shared his website below, pointing specifically to his high school seniors page. You will see that he has pages for wedding, portrait, and other photographic offerings." I'm posting this through blurry eyes! Here's a few photos of her daughter Erica that Kim shared in the same post. picks up their cell phones! Really? This photo was taken after I had gotten around a sea of cell phones to find a line of sight. And that meant that yes, I was about to get this shot, but I was now in front of the groom. I don't think you want this grand moment interfered with by a forest of cell phones blocking the view of both your betrothed and your professional photographers. And though the phones in this photo aren't terribly obtrusive, others you cannot see are being held over people's heads, blocking the view of still other guests behind them. I agree with the groom, "Those damn cell phones." As the professional photographer at a wedding I have absolutely no objection to guests taking photos except when they get in my way. At this wedding they were in my way, the groom's way, and ultimately in the bride's way. Here's what I recommend putting in your wedding program, and if you do not have a program, then in your invitations. "The bride and groom request that no photos be taken during the ceremony. Please keep your cell phones in your pocket or purse and immerse yourself with us in this wonderful moment." or whatever wording you like. But let's not have your groom complaining after the wedding about "Those damn cell phones." Have you seen an aluminum print yet? You haven't seen prints like this before and right now they are a real bargain because many times they are cheaper than good quality canvas - and I like them so much better! When printed on a white substrate, they look like you expect a photo to look, except better. The photo just pops off the surface. This is a picture of a picture that you are seeing on a screen so it's hard to get an idea of just how beautiful these prints are compared to other kinds of prints. And aluminum prints are super durable. Our aluminum prints are made with archival ink. Essentially there are two kinds of ink, and this is important. There is cheap ink, also known as dye ink, and there is expensive ink, also known as archival ink. Cheap prints are printed with cheap ink. They are not intended to last a lifetime and I personally have seen them fade in as little as two years. We only know how long archival ink can last through laboratory testing. The estimates based on those tests run anywhere from 60 to 300 years. Your photos, printed with archival ink on aluminum are about the most durable way to preserver your photos. Photos printed on paper are quite vulnerable. Not only can they tear, but moisture can destroy them. Just one very wet spring might be enough to ruin your photos. Not so with aluminum. With aluminum you can pour coffee on the print and just wipe it off. The surface is scratch resistant. If you have us print your most precious photos on aluminum for you, there is a very high probability that your grandchildren will see them the same way they look to you see them today. Want to see an aluminum print? Call or drop me a line and we'll make it happen. Really! And an unheated chapel! OK, first, congratulations to Felicia and Tyler Aplara! Two nicer people would be very hard to find. Felicia is a wedding photographer herself. But obviously she wasn't going to shoot this one! She and I have shot a wedding together before, and I was very happy to shoot her wedding for her. With her eye as a wedding photographer Felicia had thought out what she wanted for her photos and I was very happy to follow her lead. But the weather wasn't! It started raining on Friday afternoon and the temperature held just above freezing. But as we drove the 20 or so miles to the wedding venue the highway was a little icy and a couple of cars had spun off the road. The wedding was held in an historic chapel in a historic village on the grounds of the Old Threshers Reunion in Mt. Pleasant Iowa. On the backside of one row of historic buildings is a charming brick walkway. Felicia wanted first look photos here. So, with the wind blowing at about 20 mph, and the temperature right at about 32 and freezing rain and snow falling, oh, and Felicia in a sleeveless wedding gown, that's what we did. Keverly Rae - I looked at the camera back and I knew we had a chance. So I submitted these and more to Bellissima Bridal Magazine and they agreed. We missed the sunset, but this little alcove faces east anyway. We shot these in February and poor Keverly was shivering in her dress. Thank goodness for fast shutter speeds! Or is that shudder speeds?! I think things are looking up for the beautiful bride. Being chosen by another wedding photographer to shoot her wedding is, for us wedding photographers, always a great honor. Felicia and I shot a wedding together about two years ago. And yes, she is a delight to work with. In the two years that flew by life has brought many flowers to our dear Felicia. At her day job at Cambridge Investment Research in Fairfield, Iowa she has been promoted. She moved on from the boyfriend she had when I shot with her in 2016 and is now marrying Tyler Aplara and her normally sunny disposition is just simply radiant. Felicia is in love and anyone that can't see it is just completely blind. I asked her how she met Tyler and it's an interesting story. Felicia and Tyler met at a bonfire Tyler was throwing. Felicia came with a mutual friend. Tyler felt there was something between them in the first hour. He said to his best friend, Alex, that he felt there was something there. Specifically he said to Alex that he "wanted that one!" I've only met Tyler once and he seemed nice enough but here's how Felicia answered when I asked her what she thought of Tyler when she first met him. "I thought he was an a__hole but a funny, very confident, persistent a__hole." And she paused and added, "I like that"
"He can be romantic." "...cocky & loud but he's fun." Oh, and she added this - "He likes to drink." OK, so could be a wild reception, right? If you're there, you'll probably see me. I'll be the guy running around with two big cameras. If you're able to catch me flying by, introduce yourself and please make sure I get your photo!